If you thought the only affordable New York City apartment was your friend-of-a-friend’s free sofa, think again. The city is actually brimming with rent-stabilized, affordable apartments -- more than a million, in fact -- but unless you know what you’re looking for, it can be difficult to get your name on a lease. Fortunately, we’ve figured it all out: how to apply for an affordable property, how to look for a rent-stabilized apartment (no more horrific 300% rent increases when a Whole Foods opens next door), and what you need to do to qualify. Below, our comprehensive guide to New York’s elusive affordable housing. 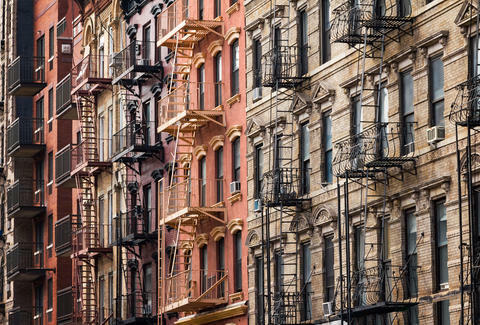 Is It Actually Possible to Find a Rent-Stabilized Apartment in NYC? We Found Out. But what even are affordable housing, rent-stabilized apartments, or rent-controlled apartments? The rumors about actual affordable housing in New York City -- and apartments with stabilized rent -- are all true. Rent-stabilized apartments (not rent-controlled, there’s a difference) are subject to a percent increase with every lease renewal, but only that set by the NYC Rent Guidelines board. A one-year lease currently has a 0% increase. Not too bad, right? These apartments typically won’t cost more than $2,700 a month, and as many as half of the apartments on the market are rent-stabilized, though many renters hold tight to these finds. But do mention to your real estate agent that a rent-stabilized apartment is a priority. They’ll likely know what apartment buildings were grandfathered into the deal (properties built between February 1st, 1947 and January 1st, 1974), and those that agreed to stabilized rent in exchange for tax exemptions. Affordable housing, on the other hand, is housing designed for middle or low-income households. This is not Section 8 housing, or even housing for families with an extremely low income. By definition, affordable housing is designed for households making a median income relative to the New York Metro Area -- and even if you think you can only afford $3 pints at drop-off service during happy hour, you may actually be making enough money to qualify. The city decides who is eligible for affordable housing according to one figure: $90,600. That’s the Average Median Income for a family of four in New York City in 2016. But how much you, as an individual, must make ranges wildly depending on the neighborhood, the type of building, the number of people you’ll be living with, and the program. There are also city-subsidized apartments everywhere from Chelsea and trendy Bushwick to rather far-flung neighborhoods like Riverdale, Bronx, and Far Rockaway, Queens. 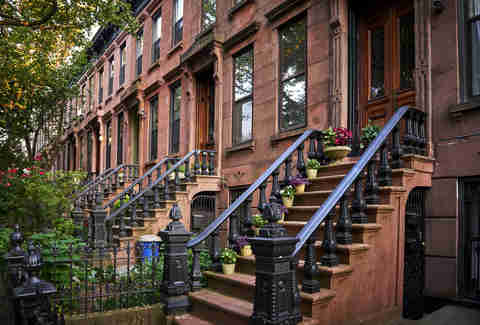 City-subsidized rentals and affordable housing options are all accessible through the NYC Housing Preservation & Development website. Amazing. So how do I apply? The internet is making it easier than ever for residents to find out about, and apply for, affordable housing. A recent study by DNAinfo showed there were approximately 843 applications per unit (and some 3,400 units in the lotteries) last year. In total, that’s nearly 3 million applications. Don’t be discouraged, because not all of those applicants were likely eligible. In order to secure your own affordable apartment, start by registering through NYC Housing Connect. Be super-clear about the guidelines for any unit you apply for. Know your combined household income, and be sure you can provide proof of your salary, as well as a credit report, birth certificate, identification, tax returns, proof of address, and more fun paperwork. You’ll have to present this all at an interview... if you’re randomly selected and survive the initial vetting process, which can take two to 10 months. It probably goes without saying that this is not an interview you want to miss, or even be late for. Revisions to the affordable housing process also include strict measures to ensure renters will use the unit as a primary residence, and that interview locations will be accessible to all. American Sign Language interpretation, for example, must be available when necessary. Let's say I win. What will my affordable housing look like? There are one-bedroom, city-subsidized units in Bushwick, Brooklyn, for example, available for one-person households making between $33,772 and $43,500 a year: perfect for a recently graduated couple of aspiring musicians. Monthly rent is a cool $985. In Murray Hill, as many as four people can rent a two-bedroom apartment where the monthly rent is $1,082. Household income can’t exceed $54,360, but more importantly, the building comes with a gym, pool, spa, and in-unit washing and drying machines. Rent is somehow even cheaper in Chelsea, where a newly constructed unit at Maestro West Chelsea Apartments, on West 28th, has a doorman and a roof deck. Currently open affordable housing includes a newly constructed apartment building, The Meekerman, in Williamsburg. One-bedroom units cost between $532 and $1,162 per month, and renters must earn between $19,612 and $58,000 -- depending on the size of the household and the specific unit. The Meekerman boasts a roof terrace, indoor cycling park, and a laundry room. On the Upper West Side, there’s a new, ultra-modern apartment building (10 Freedom Place) with a courtyard, fitness center, and laundry room (all-inclusive) with studios, one- and two-bedroom units. Up to four people can live in the two-bedroom units, which cost between $1,082 and $1,458 per month. Your collective income must be between $38,503 and $72,480. Most importantly, renters who successfully lease an affordable apartment can’t be evicted if their income changes -- even if you sign with a record label and become a billion-dollar pop sensation. Melanie Lieberman once lived in a rent-stabilized apartment, and didn’t even realize it. For apartment grumbles and triumphs, follow her @MelanieTaryn.